In 1971-72 Dr. William Howard Pugsley, donated his collection of early Canadian maps that he had collected during the late 1930s and World War II. Download digital scans of these 50 early Canadian historical maps published between 1556 to 1857 that help explain the discovery and exploration of early North America. ColorBrewer 2.0 is a simple online tool that helps you choose appropriate color schemes to use with your online mapping projects. It works with 3 different types of data schemes: sequential (data that ranges from low to high), diverging (data with equal an emphasis on critical values and extremes) or qualitative ( best suited for nominal or categorical data). You start with a sample map that does not depict actual data but has been carefully designed for evaluating the robustness of color schemes. Choose the types of data scheme that best suits your data set, next select the number of data classes and then select a color palette range. Then you will be provide with the color codes that best represents your data. You can also download a ColorBrewer style file for use in ArcGIS, Excel file including all color schemes in one file, CartoCSS styles and several other formats. The video below does a great job of demonstrating how to use the ColorBrewer tool. I first started attending conferences during University when it was required that we present our research work to professionals and other researchers in the Industry. Then the year I graduated was fortunate enough to attend the PDAC conference (now this was prior to the internet and my main focus then was to find a job in my field). PDAC is a large annual conference held in Toronto and the best conference I have ever attended. And I have been attending events & conferences ever since …. I find that although CanadianGIS.com and its social media accounts provide me great networking opportunities, it always better to have opportunities to meet other professionals in the geomatics sector and network one on one. International Symposium on Digital Earth (ISDE), also known as Digital Earth for short, was held this past week (Oct 4th-9th) in Halifax. It’s goal is to bring global leaders from the geospatial community together to further discuss topics themed around “A One World Vision for the Blue Planet“. 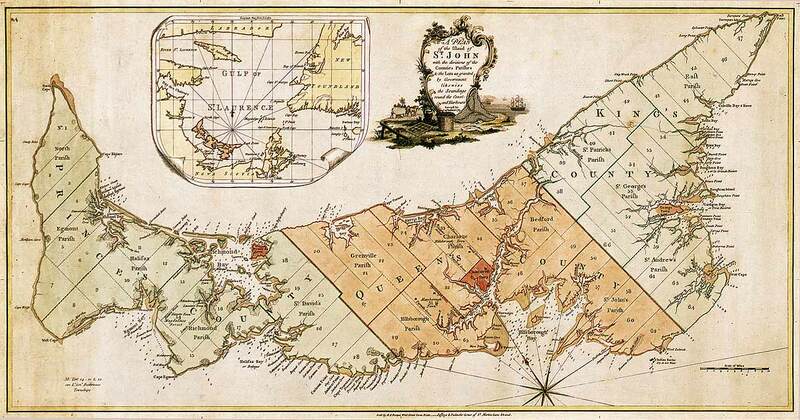 Atlantic Canada is well known for having a rich history in the world of geomatics, tracing back to the post-war era when some of the earliest computer applications in surveying and mapping were developed, and integrated information systems for geographical applications began to be used. This was also the second time that International Symposium on Digital Earth was hosted in Canada (the last time was 2001 in New Brunswick) since its inaugural start back in 1998 when former US Vice President, Al Gore gave his Digital Earth speech. Digital Earth is meant to be an event that virtually represents our dynamic planet, encompassing all of its natural and social aspects together in a geographic framework for research and everyday applications. It provides a venue that allows the geospatial community come together to work towards sustainable development ensuring that what most of us take for granted will be here for future generations. Digital Earth in Halifax explored a wide variety of geographic related theories, technologies, applications and achievements focused around planetary sciences, information technology, computer sciences, social sciences and big data. The five day conference was packed with multiple presenters from all over the world. Three to four concurrent sessions took place at the same time several times a day, each with speakers taking up to 20 minutes each to present and discuss their topics. Keynote speakers (13 in all) took place in the larger main conference room and lasted between 40 minutes to an hour. With almost 150 presentations, some presenters were able to speak several times. The down side of having so many presentations occurring in overlapping time slots meant that there were times when you had to choose to attend one presentation over another (and thus missed out on some of the talks). Half way through the conference there was an Education Outreach program that was open to the public, providing hands on activities and scientific excursions aimed to help people better visualize our planet. The Canadian Geographic Education provided one of their iconic giant floor maps and the Canadian Space Agency (with NASA) provided an opportunity to interact with some Astronauts as a way to get a better understanding of how large our Planet is and at the same time understand how small it is in comparison to the Universe. Jeremy Hansen and Reid Wiseman together provided an amazing presentation about how big Canada is, and what it is like to live on the International Space Station. NASA provided detailed digital representations of geographic data on their large high definition hyper-wall (screen made up of 9 smaller screens). Other social events included some pre-conference workshops, Student Career workshop, Opening and closing Receptions, a Pub Night, Celebration Ceilidh, Student Sociable, Mentor Lunch, and various tours to scenic areas across Nova Scotia. Considering the wide array of speakers and broad topics covered, the action packed agenda, and the abundant opportunity to network, I think Digital Earth was a good conference. I myself attend several conferences and events in the geomatics sector every year and was fortunate enough to attend Digital Earth in Halifax and certainly would go again if it returned to Canada. The most complete geographical representation ever created of Mi’kma’ki (territory inhabited by the Mi’kmaq) and Mi’kmaw Place Names is now available online thanks to the efforts of more than 100 people, spanning thousands of hours of work over five years. The digital atlas includes an online interactive map with more than 700 place names derived from approximately 1500 names collected throughout Nova Scotia from interviews with Mi’kmaw Elders and others. The digital atlas also includes pronunciation, translations, etymology, and other features, such as photos and videos of some of the interviews. 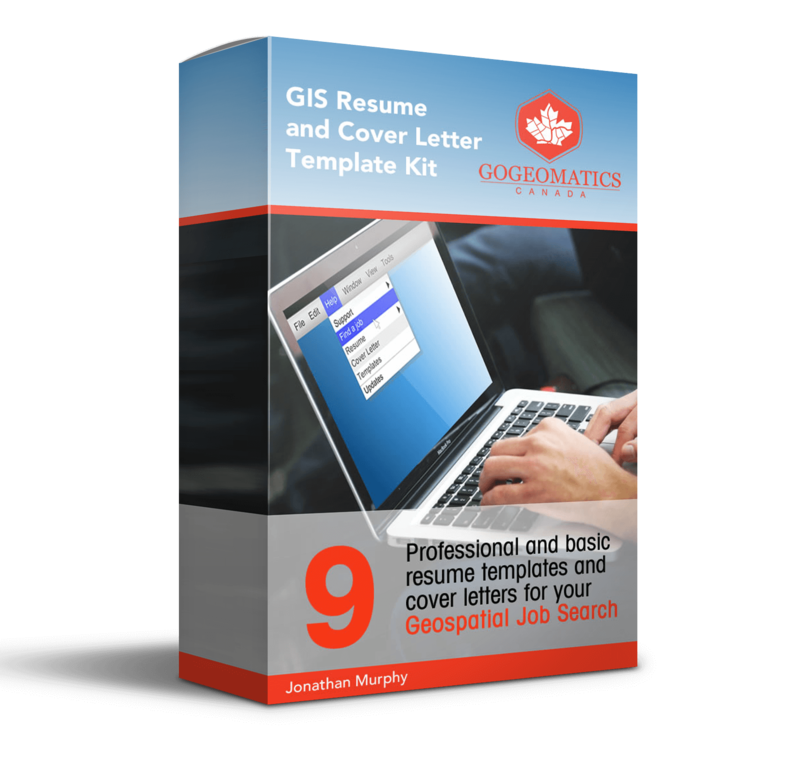 The user has the ability to customize the map by selecting various GIS layers including hydrology, terrain elevation, historical maps of Nova Scotia and much more. The city of Regina, second largest in Saskatchewan is a beautiful little city situated in the center of the prairies offering many different attractions and events that take place every year for residents and tourists alike. 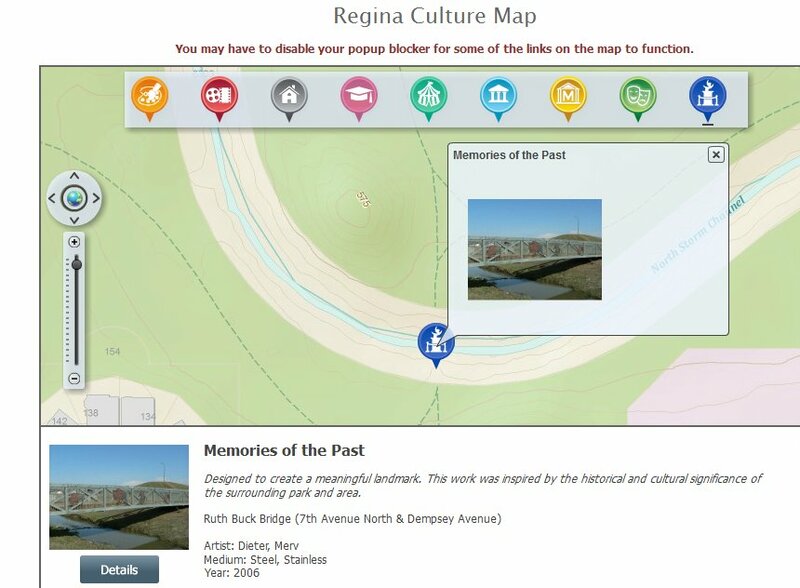 The Regina Cultural Map is based on ESRI web server technology and has been looks rather sharp while keeping it as simple as can be so that it appeals to almost everyone. Along the top of the interactive map contains is a quick tool bar with a variety of leisure and culture categories represented by artsy little icons. Selecting on of the icons then populates the map with the data from that category (categories such as Art Galleries, Cinemas,Festivals, Heritage properties, museums, public art and much more). Clicking on one of the icons that appears on the interactive map will then zoom the user into that particular area of interest and provide more information about it including, web site links, address location, photos and sometimes more details about it. 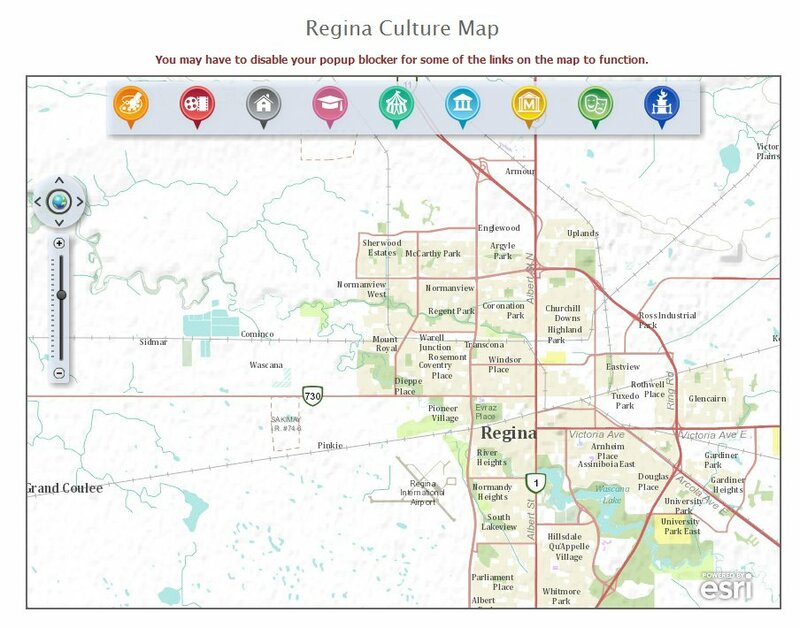 The Regina Online Culture Map is a great example of how data for an area can be spatially stored and presented in a tool that almost anyone can use while providing residents and tourists with details that can help them find the latest events and activities available to them. Today we wanted to share an image that has been posted all over the internet lately, it is a bird’s-eye perspective view image of Victoria, British Columbia illustrated by E. S. Glover, A.L. Bancroft and Co., and published by M.W. Waitt & Co. in 1878. In 1871, British Columbia joined Canada and the population of Victoria was around 7900 but dropped to less then 6000 around the time the image was published economic decline. These days the population of Victoria is over 78,000. Post Update: Had a few people send us a link to the image below, same Bird’s-eye view of Victoria lithograph image but the scan is much better. This week, DMTI Spatial and Intact Financial were awarded the Technology of the Year award, Insurer category, at the 6th annual Insurance Canada Technology Conference (ICTC) for their work in implementing real-time location analytics technology at Canada’s largest insurance company. The risks presented by flood zones, elevation, or environmental factors can affect infrastructure development and insurance underwriting. To better understand these risks during the underwriting process, Intact Financial engaged DMTI Spatial to work on a solution that could easily integrate into their existing systems and processes. Through DMTI’s location analytics tool, Intact’s 1,200 underwriters can now differentiate various risks based on the location and determine the most appropriate premiums. New quotes and active policies can, for the first time, be grouped to highlight concentration risks in a table form. Underwriters can also select a specific radius around a property to analyze. This function allows underwriters to view all properties within that radius (either active policies or new quotes being considered) in a table format. TORONTO, March 13, 2015 – At the 6th annual Insurance Canada Technology Conference (ICTC), DMTI and Intact Financial Corporation were awarded the Technology Implementation of the Year award for their work in implementing real-time location analytics technology at Canada’s largest insurance company, resulting in a 15 per cent reduction in processing time. Judging for the ICTA is based on the positive impact that a specific technology or application of technology has had on business. In 2014, Intact Financial tasked DMTI with building a real-time application that would integrate into the legacy underwriting systems and processes while allowing their team of underwriters to better understand the risks presented by existing and new policies during the underwriting process. Leveraging DMTI’s Location Hub®, Intact implemented a mapping tool that provides a visual user interface within Intact’s underwriting systems, allowing underwriters to quickly identify risks and accelerate decision making. With this tool, underwriters can see properties on a map, street map data, existing risk layers, flood zones, elevation and proximity to water data and more. The award-winning solution from DMTI Spatial has resulted in a 15 per cent reduction in processing time during the quoting process, making the payback period for this project six months. Contributing factors for this reduction included the ease of entering addresses as well as the reduction of errors when entering risk addresses. Further, the street map functionality quickly highlights concentration of risks in relation to environmental factors. Intact Financial Corporation (www.intactfc.com) is the largest provider of property and casualty insurance in Canada. The company distributes insurance under the Intact Insurance brand through a wide network of brokers, including its wholly owned subsidiary, BrokerLink, and directly to consumers through belairdirect. 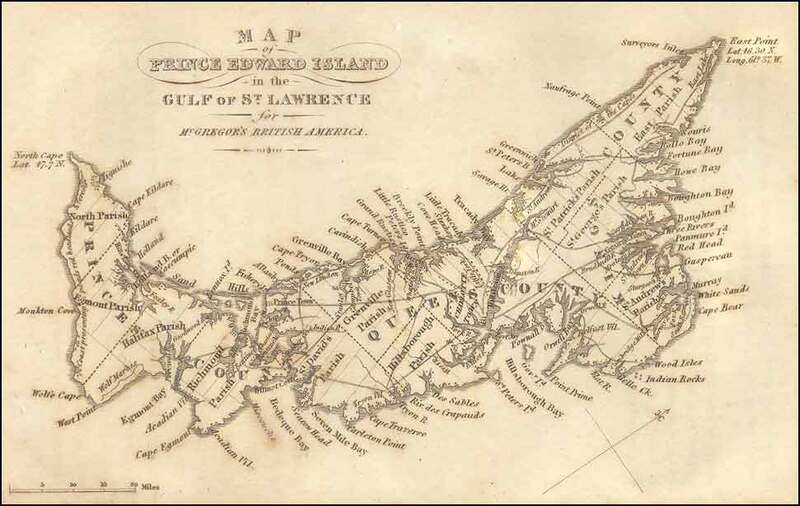 The “Island Register” website is an amazing online resource for Historic Maps of Prince Edward Island (PEI) and information on PEI genealogy. They have a database with more then 1150 lineages and 4500 documents, including photos, maps, ship logs and much more. 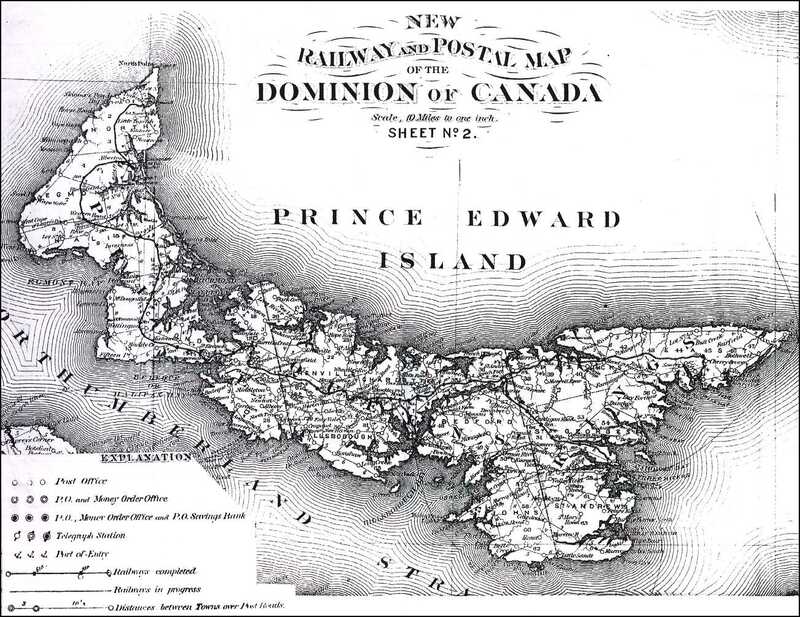 If anyone knows of other sources of old maps of Prince Edward Island then we would love for you to share that info with us, so we can include it with our collection of Canadian historic cartography section. Echosec Systems, developer of the EchoSEC social map search is pleased to announce that EchoSEC Live, the ehnanced, “Pro” offering of the service is now available (Live.EchoSec.net) – Search and Explore Public Data Like Never Before! EchoSEC is the next generation of the Search that connects you with trillions of pictures and posts made by billions of people, which never normally make it to common search engines. It also connects you with other dynamic data like flight and ship information. EchoSec’s unique way of harvesting and displaying dynamic and user-generated content from sites like Twitter, Foursquare and Instagram, gives EchoSec a completely unfiltered and real-time view of the world. And, as you would expect, the results from EchoSec are spectacular. It excels in the urban environment, but it is equally extraordinary in places where you would not expect to find shared data. Areas like military bases, government facilities, private facilities, disaster zones like Tacloban in the Philippines, and even in ‘impenetrable’ countries like North Korea. According to Karl Swannie, CEO of EchoSec. 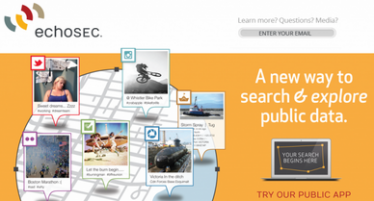 “This engine is not only good for finding the best local restaurant, but will also help in catastrophes where, for instance, we can virtually recreate a space with immediate and historic data, which is critical for first responders.” Early adopters, like the police, call EchoSec, “The most advanced contemporary analytic tool for law enforcement and security intelligence professionals” – Dr Kelly Sundburg – Chair of the Department of Justice Studies Mount Royal University. 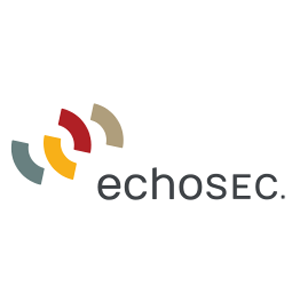 EchoSec is the proximity search tool for analysts and users who want direct and immediate connection with the information around them. This next generation of search connects you with trillions of pictures and posts, made by billions of people. Many of these publications go unfound by common search engines. EchoSec’s unique location based harvesting and displaying dynamic and user-generated content from sites like Twitter, Foursquare and Instagram, gives an unfiltered and real-time view of the world with spectacular results. EchoSec excels in urban environments, but is extraordinary for results from places where one would not expect to find shared data. EchoSec consistently delivers results from areas like military bases, government facilities, secure private facilities, disaster zones like Tacloban in the Philippines, and even ‘impenetrable’ countries like North Korea. EchoSEC is the next generation of the Search that connects you with trillions of pictures and posts made by billions of people, which never normally make it to common search engines. EchoSec is the first Search Engine of its kind to realize that ‘where’ matters as much as ‘what’, and brings it all together to clearly show the insufficiencies of current data monitoring techniques to control ‘secret’ and ‘classified’information. EchoSec’s unique way of harvesting and displaying dynamic and user-generated content from sites like Twitter, Foursquare and Instagram, gives EchoSec a completely unfiltered and real-time view of the world. Echosec Systems was recently named a Top 25 Innovative tech company in B.C in the DigiBC NextBC Showcase of companies recognizing the top technology and innovation that will shape the future of tech in British Columbia.